Main » 2015 » February » 10 » Ruben And The Jets ~ 1973 ~ For Real! 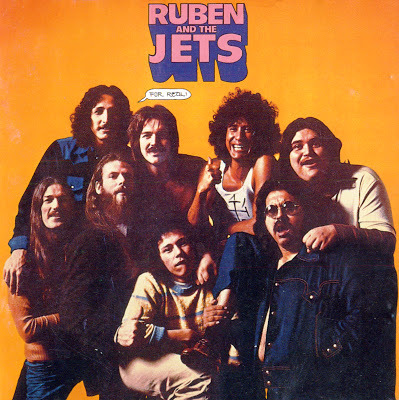 Ruben And The Jets ~ 1973 ~ For Real! In 1972, Frank Zappa decided to renew his explorations of the fifties/early sixties music, which he had already begun with his Ruben And The Jets album in 1968. This time it was "for real" and he assembled a group to re-use the name. It's an interesting complement for Zappa fans, as Sherwood, Camarena, Duran and De Guevara all played with Zappa at various times and the two covers were designed by Cal Schenkel. The musc is really enjoyable and, if its roots are clearly in the doo-wop and rock and roll styles, the pedigrees of the musicians ensure the listener to hear some excellent guitar parts, good vocals and funny lyrics (Low Ridin Cruiser, Cruisin Down Broadway, All Nite Long).